Scientists believe this rock found on a British beach could contain fossilized brain tissue. A little, brown rock from the beaches of England has now turned out to be a find for the ages. We’ve completely reconstructed their skeletons and, at least in the movies, brought them back from extinction, but we’ve never unearthed a single dinosaur brain — until now. 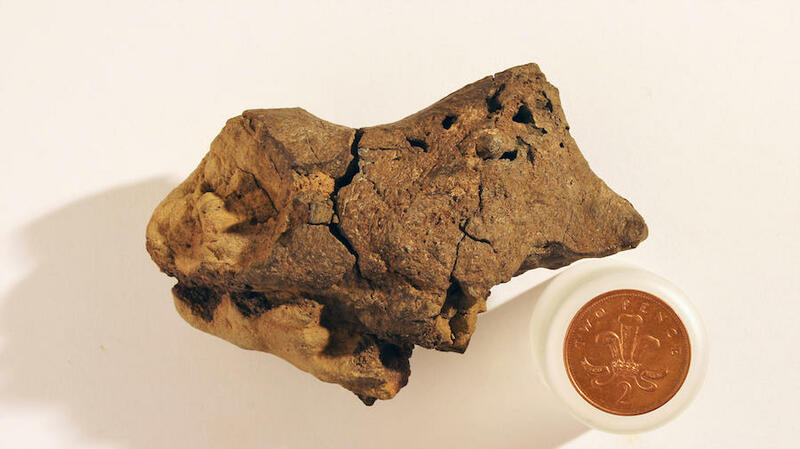 University of Cambridge researchers have now concluded that a rusty-brown rock found on a beach more than a decade ago is the fossilized brain tissue of a dinosaur called Iguanodon, a large herbivore that lived roughly 130 million years ago. Jamie Hiscocks, a fossil hunter and collector, found the brown pebble in 2004 near Bexhill, England. “He picked it up and noticed that it was slightly unusual in its shape and its texture,” said Alex Liu of the University of Cambridge. The fossil formed when the dinosaur’s skull cavity filled with sediment that hardened before the skull could break into separate pieces. Thus, the remaining solid object has revealed the shape of the inner skull cavity. Moreover, the team of researchers studying the fossil found what they think are collagen fibers and blood vessels. These form the protective outer covering that shields a brain. The outer millimeter or so of the fossil “is actually mineralization of some of the soft tissue structures that were preserved before they decayed away within the original dinosaur braincase,” Liu said. What this all means is that this particular fossil is special because it likely contains the first actual pieces of a dinosaur brain ever unearthed.